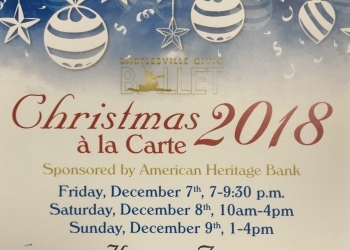 Bartlesville Civic Ballet’s Christmas a la Carte has four homes up for a tour starting on Friday. Those homes on tour include the Thill home, the Horton home, the Deathe home and the Osage Osais. Development Chairwoman Kathy Zervas explains says your ticket can be used for the entire weekend. Therefore, if you can only view some homes one day, you can view the other homes a different day. Each home will have a different style, Zervas says. She says you can purchase your tickets at Moxie on Second, American Heritage Bank who is sponsoring the event, or at Rustic Touch in Dewey. You can also purchase tickets for next weekends home tour at the Bartlesville Community Center box office or at the Bartlesville Civic Ballet’s website. Friday, Dec. 7th from 7 to 9:30 p.m.
Saturday, Dec. 8th from 10 a.m. to 4 p.m.
Sunday, Dec. 9th from 1 to 4 p.m.
Tickets cost $15 pre-tour or $20 at the door. All proceeds to benefit Ballet Bartlesville Productions. At the Osage Oasis home tour, there will be a Sugar Plum Shoppe. A bake shop and frozen enchilada sale will be on hand at the Thill home tour.